It’s been a while since the last update on Project “W”, but work is still going on though mostly on things you can’t show via some nice screenshots (and text-only postings aren’t that much fun either). I’m still on-time towards my predicted date for the first demo (early Q2/2007) and right now I think I can actually even finsh it until my self-set deadline. To achieve that I wrote down a list with all the things needed to be finished for a demo relase and that list isn’t very huge and mostly contains smaller things concerning polish of certain game features. ne big part of the work towards finishing the demo (and the game in general) includes spending a lot of hours on the graphical user interface (GUI). So I finally implemented a main menu which took me two days to get it look the way I wanted and on the screenshot you can’t see how many work I have put in, as I made a dozen different versions until it looked like I envisioned. In my opionion it fits great into the game and also looks great, as it uses a skinned interface with graphical elements instead of just plain buttons which make it look rather professional. On the right part of the menu you can see the earth rotate (and it’s also animated) but right now it looks kinda lost there, so I’ll add some animated stuff around it to make it look more attractive. And if you e.g. click on the options button the whole right side will be covered with a submenu (also totally graphical) in which you can change the options. Next step then is to have the rest of the GUI fit into the “flow” of this main menu. Basically this means that if you move out of the main menu (e.g. 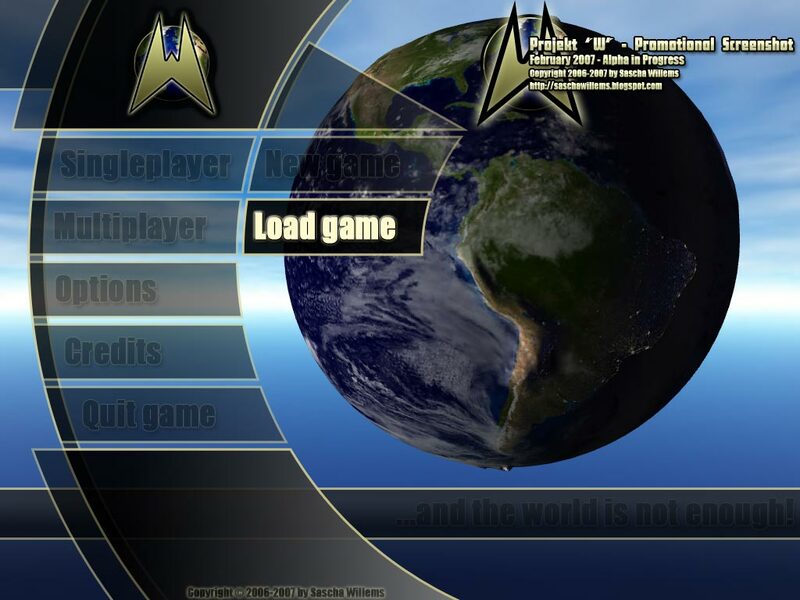 into the nation selection screen or the 3D game view) the GUI should resemble the one of the main menu, cause otherwise it would interrupt the GUI flow. I already started this with remaking the UI elements for the windows. Though they didn’t look to bad in the first place they were too simplistic and made it hard to distinguis information especially in a crowded window with lots of content. Therefore I’m in the process of redoing the whole UI interface with better looking buttons and easy-to-see captions for e.g. listbox and panels so they player can easily find the information he is looking for.